You know you want them. Admit it. ....I think the line is silly but I also think it will sell like crazy. Not gonna lie, I'd wear those. The parka is pretty cool, and looks like it could be a great parka, without the starwars connection. I like Sci-Fi but Star Wars isn't my favorite, not enough I'd wear that stuff. The blue parka doesn't really look all that strange though aside from the big strips over the arms, if I was cold I'd wear it, but I woulden't go looking to buy one. If I were to get piece of clothing from TV/film I want Walt Longmire's brown jacket. (Actually it's not that dissimilar from the jacket I have...) It's kinda mid-weight, but he's been in blizzards and survived in it, dragged people through the desert using it as a makeshift travois, and I think it's been shot and stabbed a few times without any permanent holes in it, and no matter how much blood is on it, the next episode it always looks new. It has to be the most durable garment in the world. 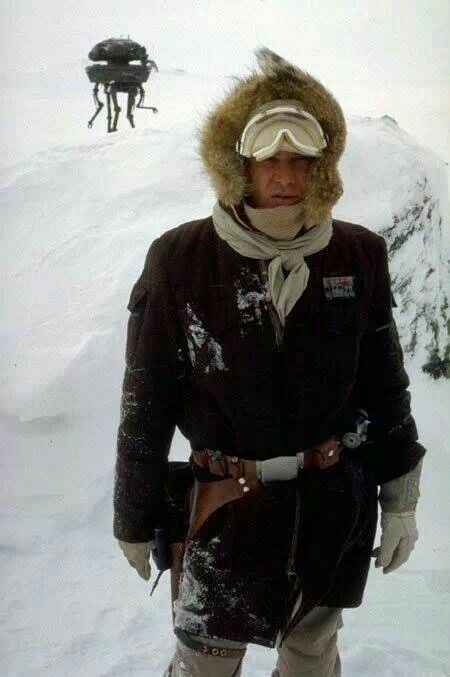 How about the Jacket Han wore on Hoth? That's gotta be warm. I already have the white silk scarf laying around somewhere from my motorcycle years.